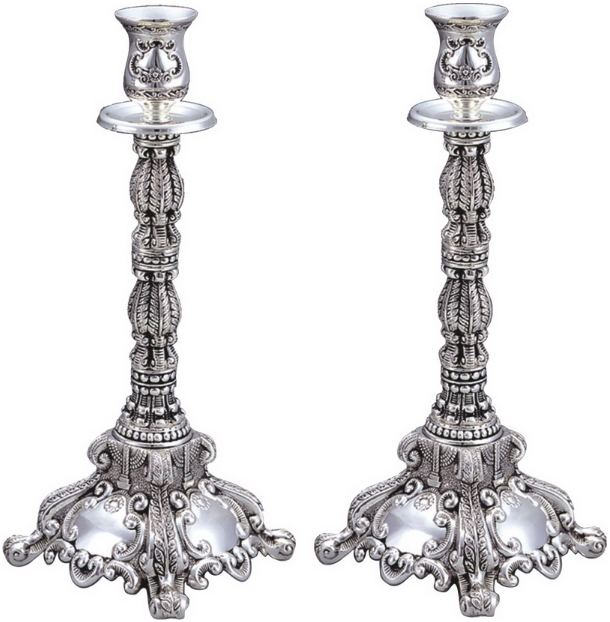 This is a pair of Shabbat candlesticks, having an all metal exterior and displaying an intricate metal work, woven around the whole body. The aesthetics combine modernity with class, which result in a product that is superior to other available Judaica alternatives. These Shabbat candlesticks are adorned with wheat and menorahs, which start from the base and grow till the neck, taking different shapes and sizes in the process. Each candle holder is 35 cm tall, with a wide base for excellent stability and a miniature cup at the top to hold the candle and beautify the frame. The pair has been manufactured under the highest standards and the attention to the smallest details in the design reveals the dedication of the skilled artisans behind it. Shabbat candlesticks are an integral part of the traditional Jewish Shabbat. Candlesticks are lit every Friday before sunset to initiate the ceremony. Therefore, they make a popular Judaica item in most Jewish houses. The candlesticks have passed strict quality checks and are guaranteed to be free of all flaws. They will be shipped in secure packaging to any address of your choice.